The Natcher Parkway east from I-65 to U.S. 231 (Scottsville Road) was not included in the redesignation of Interstate 165 due to federal guidelines. The two mile spur was renumbered as KY 9007, reflecting WN-9007 the KYTC internal designation for the Natcher Parkway. The SPUI with KY 622 (Plano Road) was renumbered as Exit 0. Future Interstate 65 Spur signs posted along the Natcher Parkway north of I-65 at Bowling Green. Photo taken 06/11/17. Originally proposed as the Bowling Green-Owensboro Parkway, the William H. Natcher (Green River) Parkway fully opened December 1972 as a toll facility connecting Bowling Green with Owenboro.2 A counterpart to U.S. 231, the Natcher Parkway spokes northwest from U.S. 231 and Interstate 65 south of Bowling Green, to its end at the U.S. 60 & 231 bypass freeway around Owensboro. 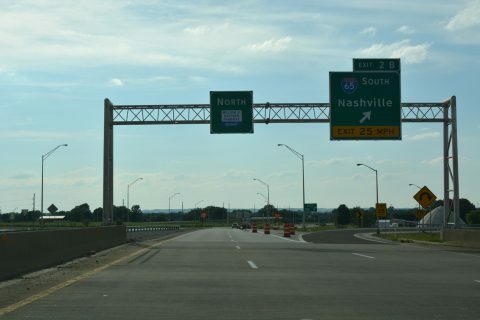 The parkway provides connections at or near Morgantown, Cromwell, Beaver Dam (via the Wendell H. Ford Western Kentucky Parkway), Hartford, and Owensboro. Though only signed with the standard name trailblazer as seen along other parkways in Kentucky, the Natcher (Green River) Parkway carries the designation of KY (WN) 9007. The William H. Natcher Green River Parkway was one of the last limited-access corridors in Kentucky to have its tolls removed when they ceased in November 2006. A two-mile extension of the parkway at its south end was added by 2012 when it was pushed further east from I-65 to end at an at-grade intersection with U.S. 231. However, as of the September 24, 2017 AASHTO Special Committee on U.S. Route Numbering meeting held in Phoenix, Arizona, the William H. Natcher Parkway was formally approved as I-165 as opposed to I-565.5 The designation was applied to the Natcher Parkway from I-65 to its northern terminus near Owensboro. 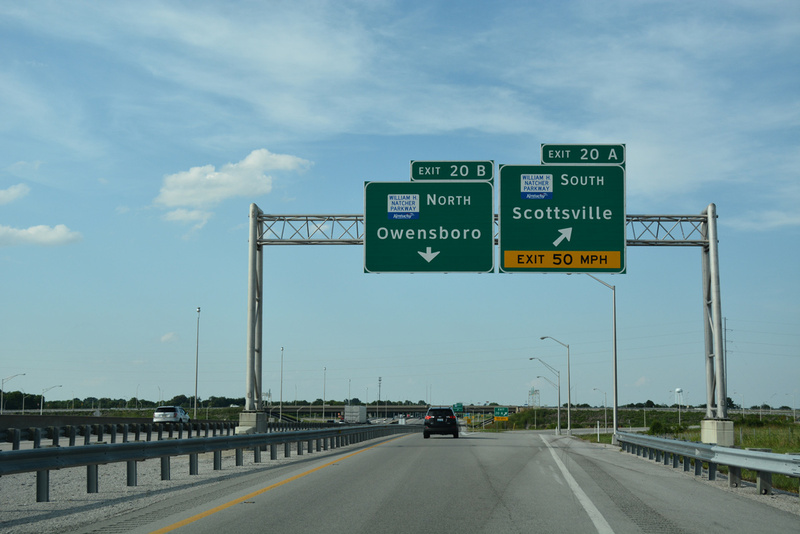 Trumpet interchange (Exit 72) with U.S. 60 & 231 (Wendell Ford Expressway) southeast of Downtown Owensboro. The William H. Natcher Parkway (KY 9007) arcs west from U.S. 231 to a SPUI with KY 622 and a full cloverleaf interchange with Interstate 65. Renumbered as Exit 1 in March 2019, I-165 takes over the parkway north from this exchange. Photo taken 06/11/17. Interstate 65 angles southwest along the east side of Bowling Green as it connects Elizabethtown with Nashville, Tennessee. 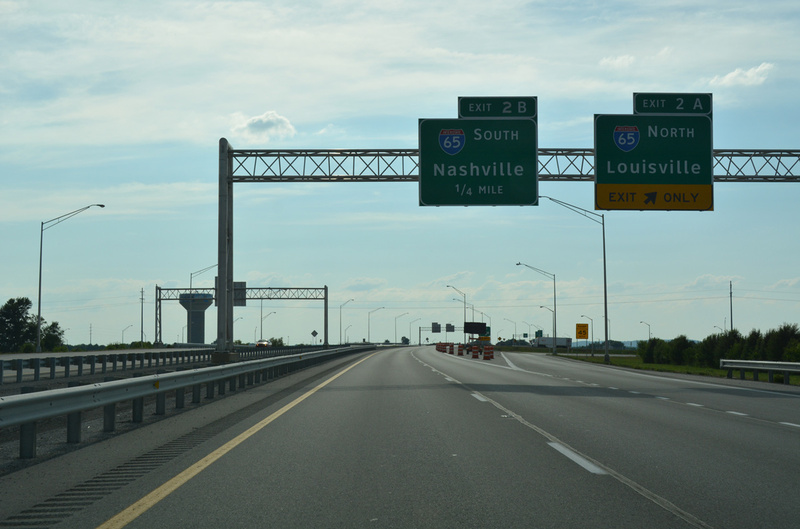 Interstate 165 (Natcher Parkway) travels northwest around the city to meet U.S. 231 again at Exit 7. Photo taken 06/11/17. Collector distributor roadways separate movements with I-165 and William H. Natcher Parkway from the I-65 mainline at Exit 22. Photo taken 06/11/17. “Kentucky’s FY 2016-FY 2022 Recommended Highway Plan”, Kentucky Transportation Cabinet (www.transportation.ky.gov). William H. Natcher Parkway, Kentucky Roads (www.kentuckyroads.com). 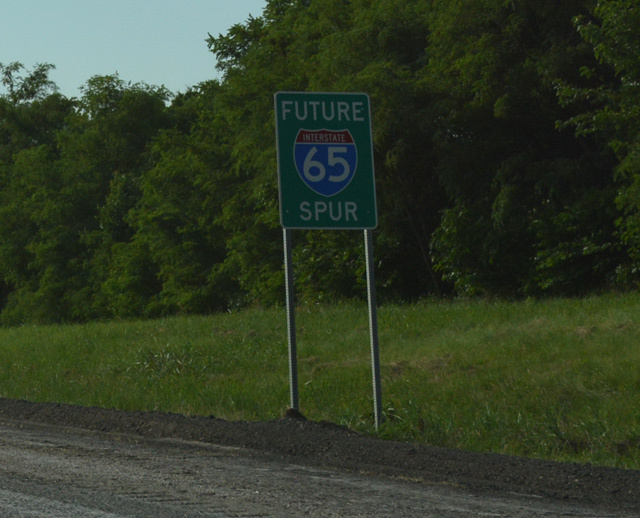 “Natcher Parkway upgrades to I-65 spur in road plan”, Beechtree News (newspaper), January 28, 2016. “William H. Natcher Parkway officially changing to I-165.” WBKO (Bowling Green, KY), March 6, 2019. 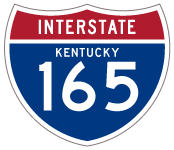 Re: I-165 Kentucky (William H. Natcher Green River Parkway) online posting by jnewkirk77, AARoads Forum, March 28, 2019.